Do you think you need a new website? Here are 30 ways to know when the time is right. 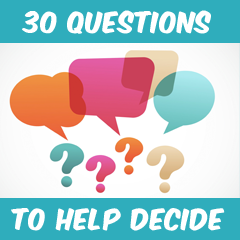 You can answer the questions right on the site or print and answer 30 yes or no questions. In less than 10 minutes you will be better informed on if the time is now. Whether you need a brand new website or a redesign of your existing, here are some way in which you can arrive to a decision. Answer the following questions honestly. This entry was posted in Uncategorized and tagged Drupal, DrupalCon, Events. Bookmark the permalink.